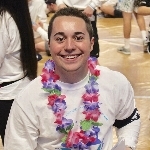 "Ohana means Family, and Family means that no one gets left behind or forgotten"
As the largest student-run philanthropy in the world, THON’s mission is to provide emotional and financial support, spread awareness and ensure funding for critical research in pursuit of a cure for pediatric cancer. Over 16,500 student volunteers unite in the fight to support over 3,700 families at Penn State Children’s Hospital so that families do not see a single medical bill from their child’s illness. Each year in February, these efforts culminate in a 46 hour, no sitting, no sleeping, Dance Marathon (THON). Ohana was created in the spring of 2008 by 12 individuals hoping to create an outlet for students wishing to give back to their community and to learn a familiar face among 43,000. Inspired by the spirit of THON and the community it creates, these twelve were determined to create a "family" on which students could rely. While we are truly dedicated to fundraising for THON, our proudest moment was being paired with our Four Diamonds Family, The Goods, our first year. We now have five families: the Goods, the Wilsons, the Dawsons, the Jezuits and the Brysiaks—where the heart of our organization lies. Aside from our fundraising efforts throughout the school year, Ohana is dedicated to providing love and support in any way possible to our four families. 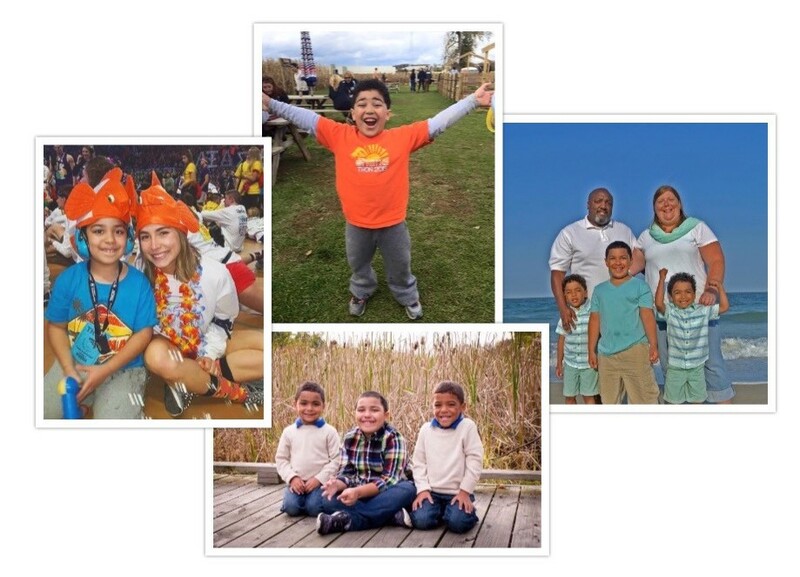 Hosting family picnics, celebrating birthdays, cheering the kids on at sporting events, and camping out in backyards are just a few ways in which Ohana is able to provide emotional support and truly integrate our families into our Ohana. The impact that these kids have made on our organization is immeasurable and we continue to fight for each of them and so that no parent will ever have to hear the words “your child has cancer. Your donation to THON is a gift that provides hope to a child battling cancer. No matter the amount, your donation will directly impact the life of a child and allow research to continue to find a cure for this disease. Please Help Ohana reach our goal, and make a difference in the lives of children like Kaitlyn, Tyler, Jay, and Ashlyn. 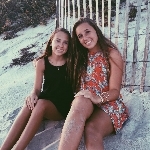 During the spring of 2016, while Ashlyn was in the heart of the season playing her favorite sport, soccer, she began experiencing severe leg pain; exhibiting signs of depression; and feeling constantly exhausted. The pain got progressively worse, to the point where Ashlyn was unable to walk and was on crutches. She was taken to an orthopedic doctor several times who advised that she had a strained hip flexor. After weeks of the symptoms not getting any better, she was taken to get blood work as her parents thought it might be Lyme Disease. However, at that time, everything came back ok. There was nothing abnormal. This left her parents perplexed and they decided to have an MRI done on her hip. What was supposed to be a 20 minute appointment turned into an hour-and-a-half. A day later they received the news that there was a major issue with Ashlyn's bone marrow. Ashlyn was diagnosed with leukemia, to which her immediate reaction to the news was “ok, what do I have to do to beat this?” Her parents, Todd and Angela explain, “Ashlyn has shown us all how to have strength, courage and a winning attitude throughout this journey. We have experienced many ups and down and so many procedures that we have lost count at this point. But through it all, she has remained positive and committed to beating cancer. Since day one, we have wanted to bring awareness to people about childhood cancer. We, especially Ashlyn, wanted people to face this horrible disease head on. She wanted people to know that, yes, a child can be diagnosed with cancer and we as a society need to face it -- all of it. After 27 months of active treatment, Ashlyn ‘rang the bell’ at Hershey Medical Center on August 1st, 2018, symbolizing her last day of treatment! We are so extremely happy and proud that Ashlyn is now CANCER FREE! Tina is 42 years old and is best friends with her sister Jillian. Tina was diagnosed with Osteosarcoma in 1988, a bone cancer common in children, when she was only 11. After her diagnosis, Tina underwent chemotherapy for 14 months until she was found to be CANCER FREE! Since then, Tina has had multiple obstacles arise as a result of her chemotherapy including being diagnosed with chemotherapy induced dilated cardiomyopathy and having a massive left parietal lobe stroke. However, Tina fought through and overcame each of these obstacles! Tina loves fun and has dedicated her time to volunteer work, even beginning her own non-profit with her sister, Cancertacular. 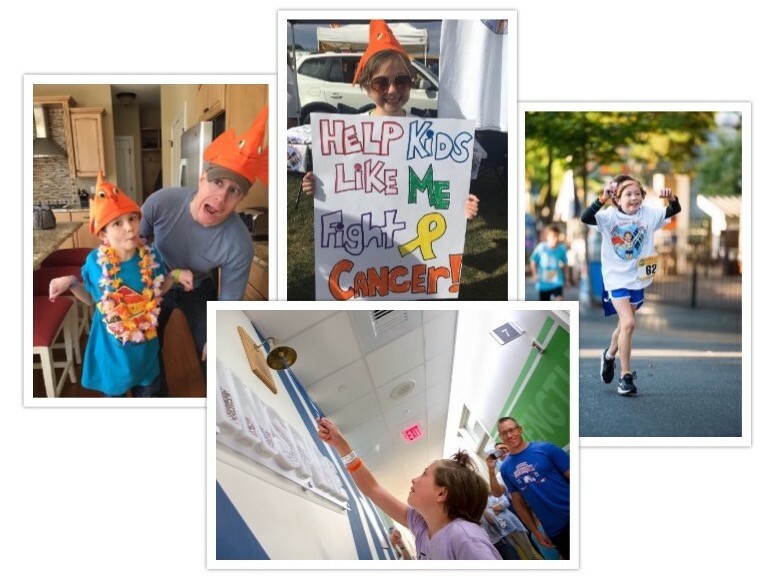 Cancertacular’s mission is to serve children battling pediatric cancer in their community, giving families a reason to laugh and smile through treatment. To date Cancertacular has served over 50 families. Tina and her sister also began Jenny’s Kloset, in honor of Tina’s close friend who unfortunately passed during treatment at Hershey Medical Center. Jenny’s Kloset provides food and toiletries to families in their area who are in need. Tina has devoted her life to giving back after she says THON gave so much to her. 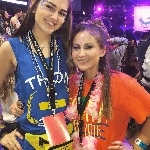 Tina chose to become involved in THON this year, many years after her diagnosis and treatment, to become more involved in THON’s mission. Ohana can not wait to continue to build a relationship with Tina and see what incredible things she does next! Jay is 7 years old and the oldest of the three Dawson boys. He is super social and loves to be active! Chasing around his twin brothers, playing outside, and attending school are what makes Jay one of the happiest kids around! Becoming the loving and playful little boy he is today is something that his parent’s, Tiffany and James, were afraid would not be a reality back in 2012 when he was diagnosed with a brain tumor in the left temporal lobe. Jay was only 15 months old at the time when he underwent resection surgery the very next day after diagnosis at Hershey Medical Center. In his very short life, Jay and his family have been through many obstacles with this disease, and Jay still continues to have minor effects from the tumor. He is currently cancer free!!! Ohana welcomed the Dawson’s in with open arms and the relationships that have flourished through the pairing mean so much to our organization. We have watched Jay grow up, and have been there through many stages of his recovery with lots of laughs and hugs. Jay and his family mean so much to Ohana and we are thankful for this pairing each and every day. He has shown so much strength and continues to fuel the passion that our organization has for this cause. Tyler Wilson is the youngest of four brothers, Dylan, Dalton, and Conner. Back in June 2010 when he was just seven years old, he was diagnosed with Stage IV Burkitt's Lymphoma. He was mis-diagnosed with Lyme disease and that lead to the progression of the cancer and the late stage at diagnosis. Tyler spent most of the summer of 2010 in the hospital where he received dialysis, multiple blood transfusions, and life-saving chemotherapy. He over-came bedsores, pneumonia, and an extra-heartbeat, along with horrible mouth sores (a side-effect of chemo). With the help of physical therapy he learned to walk again. In October 2010 a CAT scan revealed that Tyler was CANCER FREE! The Wilson’s love to spend time as a family and are up for whatever the day holds. Tyler is quiet around new people, but at home his personality is what lights up the house! If he could spend all day fishing, he absolutely would! He loves hockey, and just being outside! Watching Tyler grow up into the teenager he is today has been such a fun experience for Ohana! Watching his eyes light up when he enters the BJC during THON weekend is what we thrive off of! Ohana’s proudest moment came when we were paired with our very first Four Diamonds Family during our first year, The Good’s. As much as Ohana and the rest of Penn State Volunteers love THON, it’s no comparison to Kaitlyn’s adoration for this cause. She has grown up as a THON child, and will always hold the title as “Executive Chair” of Ohana! She is a social butterfly that easily lights up any room that she enters. 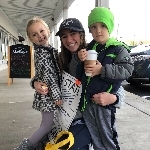 Kaitlyn loves spending time with Ohana, and she always looks forward to our trips to her home, or coming to hang out with us in Happy Valley. Kaitlyn is currently 26 years old and lives an incredible life! She loves to bowl, play tennis, spend weekends at her family’s home in Cape May, and compete in the Special Olympics each year! 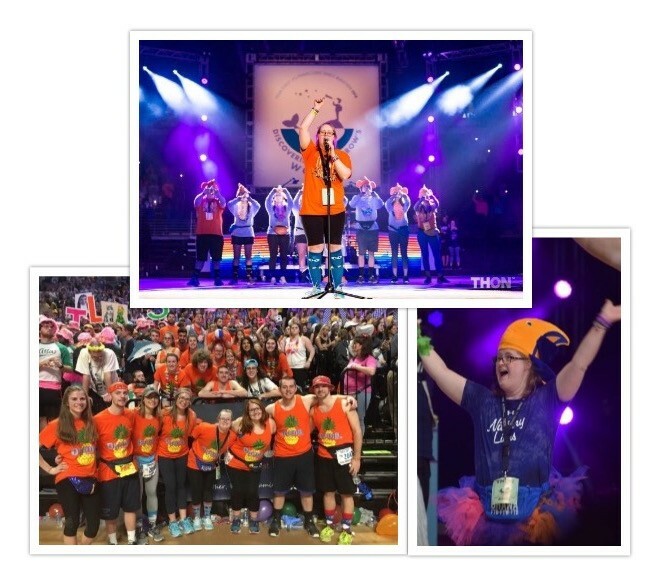 Our members look forward to seeing her light up the stage during THON during the Talent Show each year. It’s hard to imagine Ohana without Kaitlyn, she’s our star! Special Interest Organizations play a key role in helping THON fulfill its mission of conquering childhood cancer. 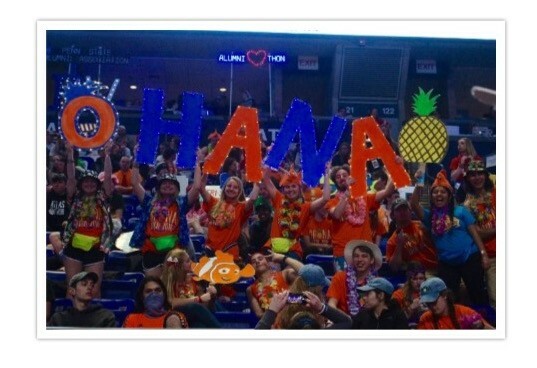 Ohana is a Special Interest Organization at Penn State whose sole purpose is to support THON and our Four Diamonds Families. Throughout the year, Special Intereset Organizations contribute to the efforts of thousands of Penn State students by facilitating fundraisers and providing emotional support to our families.